Zeal VariPro - Step Into the Revolution. In a quest for ultimate helicopter performance, Zeal steps into a new rotor blade design that abandons conventional layouts and traditional form. To unlock the full potential of intense 3D flight, a new aerodynamic approach is necessary - an unconventional layout in design and shape to extract maximum potential that can be seen, felt and absolutely heard. Enter the Zeal VariPro - an all new rotor blade design that abandons the conventional symmetrical rotor blade layout for a fully variable chord thickness & chord width, providing new elements of efficiency and symmetry of lift for the ultimate in aerodynamic perfection. Drawn from the pages of full scale rotor design, the VariPro rotor blades utilize varying chord and root thickness throughout the full span of the rotor to balance lift production across the rotor span. Due to high rotational velocity at the tip and lower rotational velocity near the root, these aerodynamic asymmetries increase drag, foul lift symmetry and limit the full rotor potential. With the VariPro design, these limitations cease, with an optimized airfoil layout that provides balance, precision and ultimate levels of 3D performance. Extracting greater levels of efficiency due to the variable aerodynamic contours and shaping, the VariPro rotor design provides greater levels of thrust with less overall drag, allowing the blades to harness the full power being delivered to the rotor disc. Crisp, powerful & efficient, the VariPro form unleashes the full potential of your aircraft for maximum levels of 3D aggression. Step into the new revolution of rotor blade design with the all new Zeal VariPro. Power, efficiency and aerodynamic bliss await your next flight, ready & waiting to unlock the true performance within. Taking the rotor disc as a whole in forward flight, lift production varies dramatically across the entirety of the blade. This equates to massive imbalances of lift production and drag, translating into reduced aerodynamic efficiency. With a variable chord thickness approach, lift can be balanced out, with a net reduction in overall drag, equating to greater power and less rpm sag under load. Drawing from the same principle above, further aerodynamic gains can be achieved by varying the chord width of the blade from root to tip, drawing the same aerodynamic gains when it comes to lift symmetry, drag reduction and overall aerodynamic efficiency. Unlike traditional symmetrical rotor blades that utilize one set chord width from root to tip, this variable layout optimizes rotor lift that exponentially increases the power that can be harnessed via the rotor disc, equating to new levels of responsiveness and control. 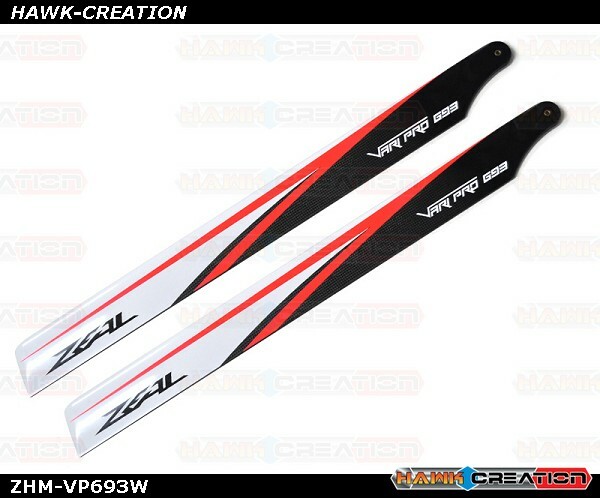 Utilizing high quality carbon fiber & bonding resins, the Zeal VariPro rotor blades are optimized for high strength & low weight for peak levels of 3D performance. Low weight equates to lower overall inertia, resulting in ultra high levels of rotor response with crisp & agile flight characteristics. Furthered with high strength carbon fiber to maximize high disc loading in 3D flight conditions, the VariPro rotor blades are built to withstand intense levels of stress & loading, without fail. Considering the rotational velocities obtained in modern RC helicopters, safety is paramount when protecting the pilot & bystanders in the case of blade failure when a crash occurs. Utilizing an integrated safety wire system, the VariPro rotor blades will fail in a safe manner by maintaining their overall integrity, offering a last form of protection when the worst case scenario plays out. Seasoned veteran or a pro in the making, the VariPro design optimizes the flight characteristics to better the performance, stability and overall aircraft predictability. With a cutting edge full scale rotor design, VariPro rotor blades maximize the potential of your RC helicopter, and in the end, maximize the potential you can obtain.